Well, those who know me, know I make dry-erase charts as a profession. 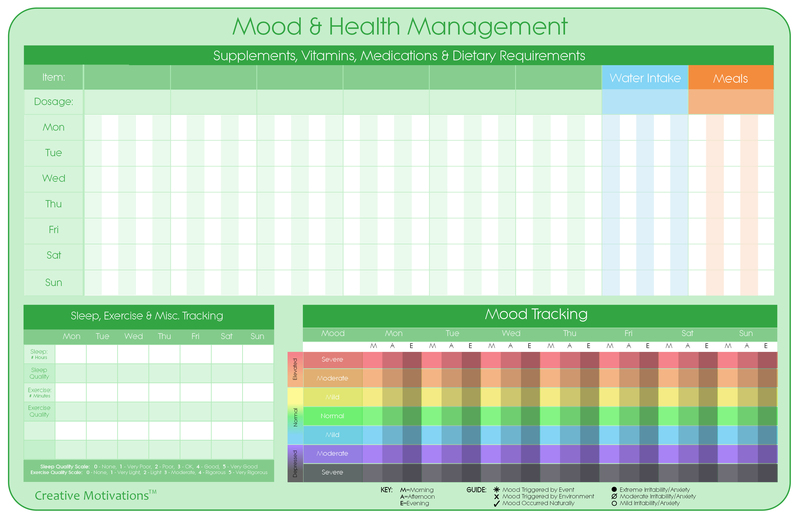 I had been planning a chart especially for mood management for a long time and now that I’m finally taking my treatment more seriously, I finally got around to it and I must say, the results are pretty awesome! I asked around in various BP Support Groups and dug around on the web for ideas and inspiration and this is the final products. I should probably create and instruction/suggested use sheet and I will when I get around to it, but in the meantime, I’ll explain each section here and you can print it out if you’d like. I am making the chart available as a PDF free of charge (probably for a limited time) and for those who want it already printed and laminated professionally with dry-erase marker included, it will be available in my Etsy Shop for $14.99 + shipping. Its the only product of its kind in my shop (I primarily make and sell children’s educational products, lol) and as far as Ive seen, the only product of its kind available, so I hope it will help lots of you get your lives in order and on-track! Use the Medium Green Squares at the top of each column (in the “Items” row) to write down the name of your medication, vitamin, etc. Each column has 5 sections that can be used as individual dosage markers (up to 5 doses per day) and can be checked off as you take each dose, or you can use the space to record side effects (nausea), timing (taken late), effectiveness (less depression) or length of time taking (4 days), etc. Whatever fit your needs best. Use the alternating white and blue squares to record separate instances of water intake, i.e. you could say “16oz, “8oz,” etc. OR if you have a set amount that you drink in (say a 16oz water bottle) you can just check off each time you finish one bottle. I included water intake because dehydration has a very powerful effect on mood stability. Read my other posts on water intake and the water intake challenge. There’s a lot of room for flexibility here, so be creative. I included this area because I very often forget to eat and I know others complain about overeating when depressed, so use it in the way that works best for you. In my case, I use the “dosage” square to write a letter above each little column below, so I have “B” for breakfast, then “S” for snack, “L” for Lunch and so on. Then I simply check off whether I had that meal today. Very simple. For others you could write in a calorie count to maintain, then record the calories for each meal, or even use the 2 orange columns to record things you want to avoid (caffeine, sugar, etc) and the white columns for your regular meals or things you want to eat more of (lets say veggies, whole grains and protein) and just record how many servings you had each day. Use the Sleep rows to record the # hours and quality of sleep each day, the Exercise rows to record the # minutes exercising and the quality/rigorousness of the exercise each day, and the blank areas are to customize a tracking element that’s important to your treatment plan. For example, personally, Im using that as an “outdoors” tracker, meaning how often I get out of the house and get fresh air/sun, its a real challenge for me… and hopefully Ill be able to see how it relates to my moods. But I figured not everyone has that problem, so you could use it for “socializing,” “journal writing,” “relaxation time,” “prayers/religious devotion,” etc Whatever is important for you personally. Use this area to track your moods throughout the day/each week. Im a rapid cycler and my moods can change drastically within a single day/week, I havent found any charts that allow you to track varying moods through out the day, so I figured “morning, afternoon, evening” ought to be sufficient for rapid cyclers like me, and you can easily look and notice patterns [like Im always manic at night, etc] and hopefully make lifestyle/nutritional/med changes to normalize a bit. So the “M, A, E” stands for Morning, afternoon and evening, and the squares get progressively darker as the day progresses. There is a little key, which you may or may not need, that I’m using allowing me to record whether the mood occurred naturally, was triggered by an event (like an argument) or by my environment (like the kids are home and being wild or I went to a party, etc). You can also use the key to add in whether youre experiencing irritability or anxiety along with the mood. The color chart portion allows you to mark where you fall on the depression/mania scale… that’s pretty self-explanatory… however, if you are feeling a sense of numbness/apathy, you may want to create a special symbol for that and mark that in the green “normal” row, as there’s no special area for a lack of emotion/feeling. The nice thing about this chart is that its flexible… you can place your mark in between moods if your not quite feeling it at the level described and when you step back and look at the end of the week, you’ll see if any pattern emerge. So I think that’s about it. Let me know if you have any questions. Hope that helps! Categories: Dietary, Exercise, JOURNAL, METHODS, Mood Tracking, Other, RESOURCES, Sleep Regulation, Supplements, Tools, Uncategorized | Tags: bipolar, chart, Dehydration, dry-erase, mania, manic depression, mental-health, methods, moods, orthomolecular, stress, tracker, tracking, triggers, vitamins, Water | Permalink. Today is my first day starting them and it will take several weeks to see results, so we’ll see how it goes (God-willing)! I know what you’re thinking what is Atlas MD and why are the Riordan Lab Tests so expensive? Well, the Riordan prices are the retail industry standard. Atlas MD is a concierge medical service I recently signed up with (I’ll be posting about that awesomeness in another post soon) and part of the benefits of the program/membership ($50/month) is that I get labs at wholesale prices (what the doctors pay). So, yes, your doctor is charging you an arm and a leg for those labs and its robbery! So I bet you can guess which office I got most my labs done at, lol. I’ll actually be getting those results today for my first full appointment at Atlas, so Ill be sure and post the results 😉 Who’s excited? Categories: METHODS, RESOURCES, Supplements, Tools, Uncategorized | Tags: bipolar, manic depression, mental-health, methods, moods, orthomolecular, pyroluria, pyrrole, pyrroles, symptoms, testing, urinalysis, vitamins | Permalink. So I finally went in to see a doctor at the Riordan Clinic in Wichita, KS! I am seeing Dr. K, who is very nice and was very comprehensive for our first appointment. We discussed my symptoms, health history, experiences from childhood, general diet, health and nutrition, my concerns, habits, etc. The environment is lovely… long winding roads surrounding by nature and wildlife leading into the building complex, the indoors was not clinical… but a refreshing, warm but modern decor with an edge of nature-nut, like all the supplements were available there in the waiting room in a mini shop-shelf configuration, as well as books/literature, a bowl of fresh organic apples, coffee, tea and the usual goodies. The exam room left something to be desired, could have been as warm and inviting as the rest of the facility, but it seemed lacking, like it needed a few plants, though the walls were all rounded (due to the dome configuration) which was a nice touch. 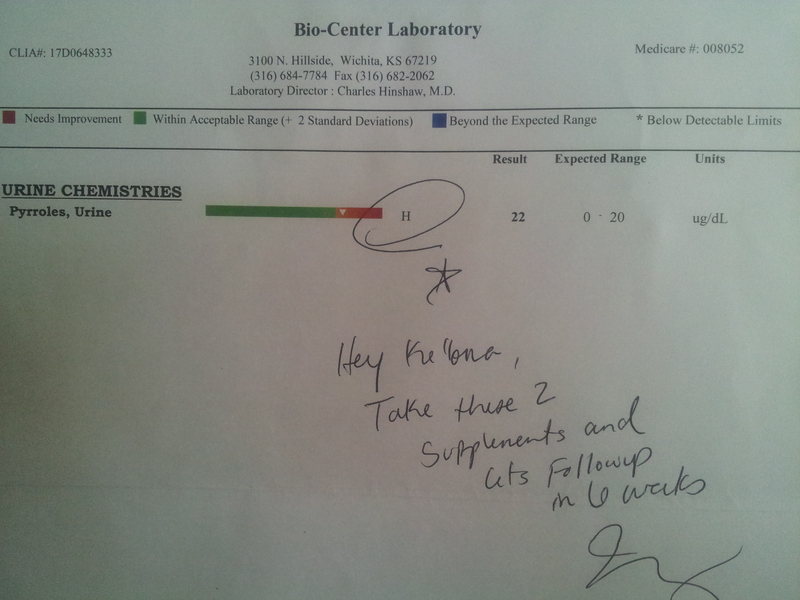 After discussing everything and getting an exam, Dr K. prescribed a few supplements, I got one lab done to test for pyroluria (most of the rest of the labs I got done at my other healthcare provider as it was way cheaper, Ill detail that in another post) and I made an appointment to return in 4 weeks. I felt energized after the appointment, very hopeful like I am on the right track. She also educated me on a few things, namely, it sounds like my adrenal gland is absolutely worn out, many of my symptoms indicate the likelihood of a thyroid-based source for my BP symptoms, the alopecia and thinning hair is very likely connected to the same problem, and a few other little tidbits that shed a lot of light on what Im experiencing. Naturally, Ive struggled a bit with consistency, but I recently made myself a pretty awesome dry-erase chart (another post to follow) that seems to be helping TREMENDOUSLY and which Ill make available to all of you. So I think that’s about it. I feel really good about beginning to take a more serious approach to managing my BP. I hope to share some amazing results with you all in the next few months. Cheers! Categories: Dietary, METHODS, RESOURCES, Supplements | Tags: bipolarism, manic depression, mental-health, natural, nutritional, orthomolecular, pyrolles, pyroluria, pyrroles, Riordan, symptoms, testing, vitamins | Permalink. This is where I will list the various methods I intend to try out in order to manage my bipolar disorder (under the “METHODS” category, surprise!). The list will be updated periodically as I receive suggestions, do research, and make progress. I will add the relevant links to info about each method + links to my progress reports as each method is tried out. If you have any suggestions or comments, feel free to post, guys, and if you want to try a a technique/remedy out with me, just let me know. Id love to work with someone and have a BPBuddy! My technique will be to try out a natural remedy, coping technique, or management method for a set number of weeks, 4-6 weeks ideally. I will make at least weekly posts about my approach, experience, and progress with each method I try out. I will also be sure to not lapses I have in utilizing the approach properly. etc. My goal is develop a lifestyle complete with proper nutrition, exercise, stress management and supplements, if necessary, to manage my BPD in a manner that allows me to live a balanced, healthy and happy life. Lofty goals indeed, but I am determined and convinced that it’s possible. I will trying out methods that I learn about via research, recommendations, etc. I am not a doctor and I am not under the care of a physician, so do not take any of my advice as actual medical advice. You are witnessing my own personal experience here as it fits with my lifestyle, personal health, and manifestations of my condition. How you or your body and mind will react to these different methods and treatments depends on your own condition, lifestyle, and present state of health and may vary tremendously. However, I think the key to any natural treatment is finding the right balance and being consistent. So if you do try out some natural methods for managing your BPD, keep those things in mind. I will be trying out dietary changes, supplements (vitamins and minerals), stress management techniques (like meditation, deep breathing and yoga), stress reduction (keeping a schedule, reducing responsibilities, changing the layout of my home), exercise, sleep regulation, daily journaling, mood tracking, and faith-based exercises (Islamic – Duaas, Dhikr, Study, Consistent Prayers, etc), and anything else I come across that seems promising. Feel free to ask questions and make suggestions! Cheers! Categories: Dietary, Exercise, METHODS, Other, Sleep Regulation, Supplements, Uncategorized | Tags: methods, natural remedies | Permalink. But seriously, I was browsing the web for natural remedies and this was one of the first things I saw. The site that mentioned it was utterly unconvincing, but I decided to click a link to where you could get the testing. And low and behold, the gold-standard of pyroluria testing takes place in a huge fancy shmancy lab literally down the street from me. Mind you, I’m n Kansas, and there’s next to nothing in this one-horse town (sorry, Im from L.A. my views are skewed)… so this was shocking and yes, I took it as a sign. 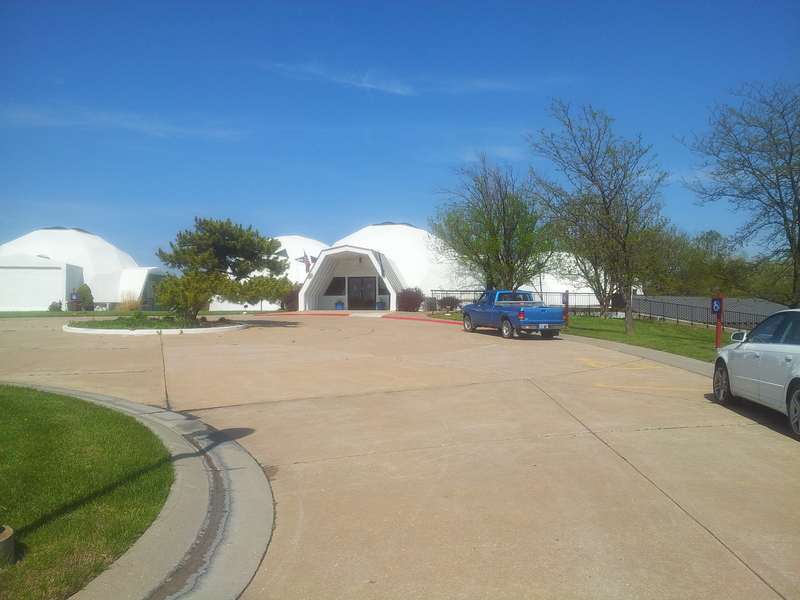 I’ve always wondered what the weird place with the white domes was and it so happens to be a lab where you can get various health panels and lab tests. But wait, there’s more. So I decided, y’know, lemme look into this pyroluria thing and see exactly what it is… I mean, cuz that’s kinda weird, right down the street, right? So let’s see what we got. The symptoms of people with pyroluria fit me dead on. Now THAT is scary. So, let me detail it for you here, I’m just going to list the symptoms that fit me and I’ll include some links for your own edification, for perhaps this is a place to start for you as well. Pyroluria is a condition characterized by extreme deficiencies in Zinc, B6, and an omega-6 essential fatty acid (arachidonic acid). A pyrrole is a basic chemical structure used in the manufacture of heme, the stuff that makes blood red. Pyroluria is a genetic disorder in pyrrole chemistry, characterized by an overproduction of kryptopyrroles (meaning “hidden pyrroles”) during the synthesis of hem0globin (the iron-rich component of blood that carries oxygen). Since kryptopyrroles bind with vitamin B6 and zinc, which is then excreted in the urine, this leads to deficiencies in these two nutrients. Also, B6 is needed in the production of serotonin, so when you’re running short, your serotonin production level drops. Sounds simple, right? You have a genetic disorder that causes your body to make too many little pyrrole guys. These guys are good because they help make blood red (Yay! who wants orange blood? ), but if your body makes too much, these guys start snatching up all your Vitamin B6 and Zinc and then carrying it all out on the urine train. Not fun. So basically, you have a vitamin deficiency. OMG! Could it be? A vitamin deficiency is what’s causing your BP symptoms? Sounds like quackery, right? Well, yeah, vitamins aren’t profitable for the pharmaceutical companies, you can’t trademark them, so you’re not gonna get too many doctors getting pay-offs for telling you hey try some zinc rather than zoloft. But that’s a whole other issue, let’s stay focused. So now we know what it is, but what does it cause? Why did I take it as a *dun dada daaaaa* sign? Ok… so what tripped me out is not only the BP symptoms that are common to people with pyroluria, but the totally random symptoms for which I’ve had no explanation and which have plagued me for years! I’m the lightest person with the lightest/finest hair in my family; my teeth are crowded AND cavity prone; I have aching knees (can’t keep them bent more than a few minutes without increasing aching/pain) for no apparent reason; I have eczema, acne, etc; and I have perpetually cold hands and feet, again with no explanation. This and all the other symptoms I mentioned were a red flag for me. I’ve never seen a single condition mention ALL of these as potential symptoms. Crazy right? No, not crazy, it seems totally logical to me to feel that this pyroluria testing might be a great place to start. What do you think? NOTE: There are other symptoms as well, and not all symptoms will apply to every person, so if you’re seeing a few things that apply to you, by all means, research it more, my friend. Can you imagine if your BP is just a nutritional imbalance. Man, that would be so awesome. What do you think? I’m getting pyrrole testing! All it is is a simple urine test. Yep. That easy. Now determining treatment if I come up with high levels of pyrroles will be the true challenge, but we never know until we’re tested, right? And remember how I said that fancy lab happens to be right down the street? Yep, even better. But if you’re not local to Wichita, KS then you can order the test via mail, it costs $73, which though I’m broke with seven kids, lol, seems a small price to pay if it can lead me to a cure. I’ll list some resources and links below. So what do you guys think? Are pyrroles something you want to look into? Categories: METHODS, Other, Supplements | Tags: b6, bipolar, manic depression, mental-health, moods, orthomolecular, pyroluria, pyrrole, pyrroles, symptoms, testing, urinalysis, vitamins, zinc | Permalink.